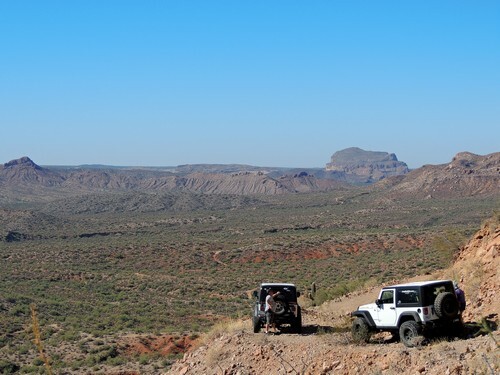 Walnut Canyon is certainly one of the most scenic Jeep trails in the area. 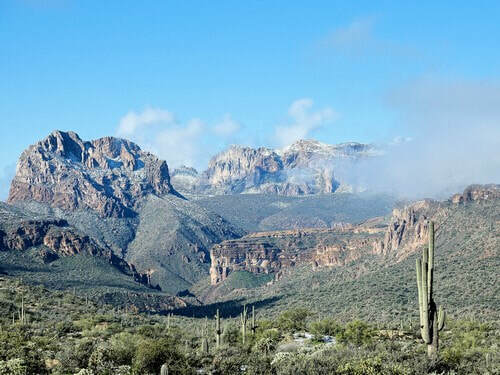 It skirts the edge of White Canyon Wilderness, and the canyons and mountains along the trail are spectacular. Much of the land approaching Walnut Canyon is owned by Asarco, owners of the Ray Mine and other properties in Arizona. Access is now allowed, but can be revoked at any time. They closed access to Monkey Springs and the Miner's Revenge 5.0 Jeep trail, in this same area, in 2014. 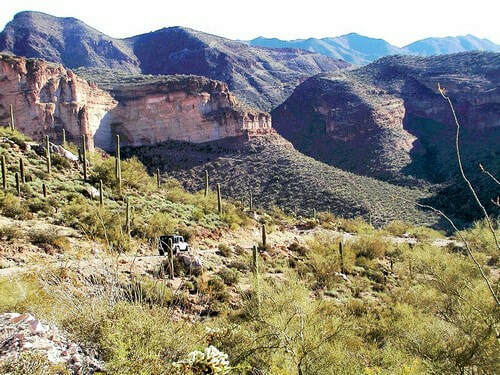 Most people will start on Highway 177, about 10 miles south of Superior. 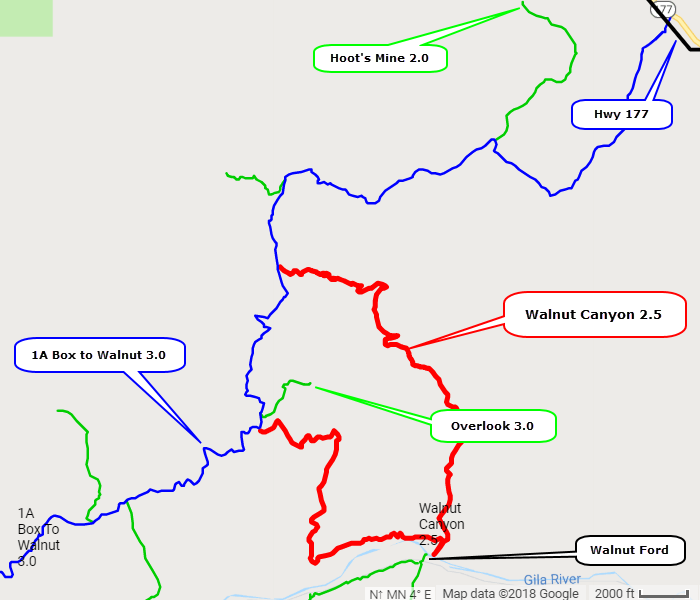 An optional addition to the normal Walnut Canyon trail is to visit Hoot's Mine on your way in from Highway 177. 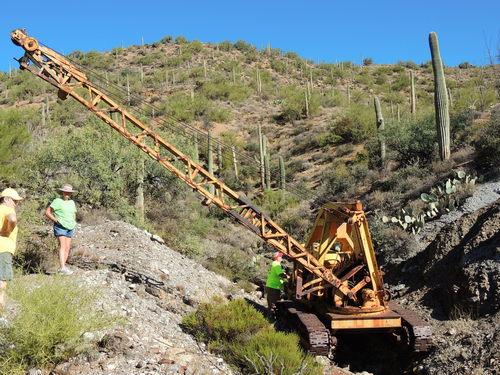 This is an easy trail and there is an old crane to investigate at the mine. Download the track in Minor Trails GPX file. Keep a sharp eye out for Desert Bighorns. We occasional see them on high bluffs during this trip. We like to drive the loop in a clockwise direction, and have described it in that direction. 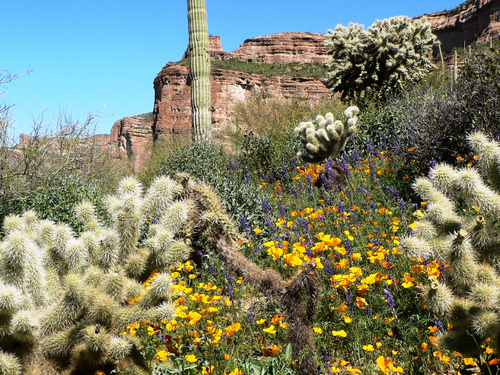 There are many nice vistas, and wildflowers are abundant in the spring. 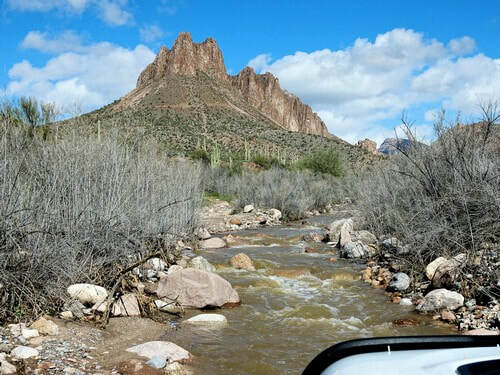 Walnut ford on the Gila River is a great place to play if the river flow is not too high. 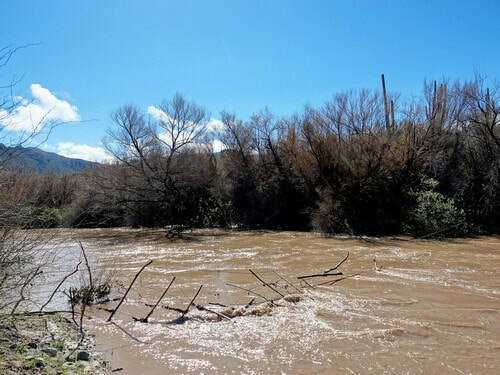 The first photo was taken when the flow was 365 cfs at the Kelvin gauging station. It is a good place for lunch at any river flow level. Not good for crossing at higher levels. 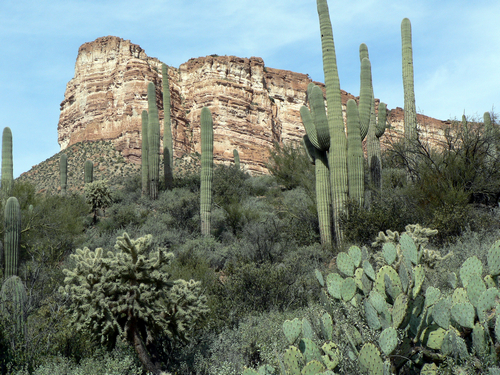 After visiting the ford, head west along the river then turn north up Lower Walnut Canyon. 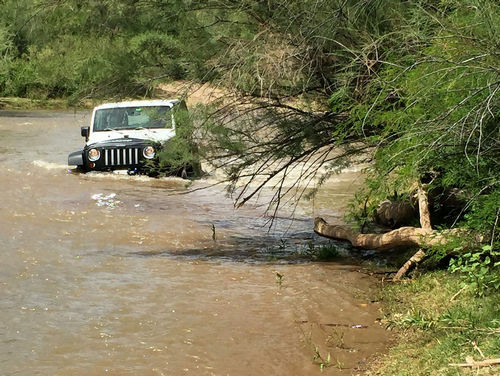 The trail is in the wash and is a lot of fun to drive after a heavy rain. The first photo was taken from an overlook on the side of the bluff seen in the second photo. This overlook is at the end of the Walnut loop, where 1A Box To Walnut 3.0 goes west toward the Coke Ovens. 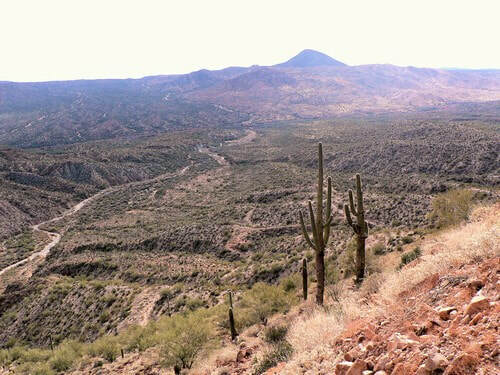 This overlook photo shows where 1A Box to Walnut 3.0 Access Road heads toward the Coke Ovens and Box Canyon. The overlook only has room for 3 or 4 Jeeps to turn around, but is a nice side trip. Note it is rated 3.0 due to a steep loose climb. There is a geocache hidden at the end of the road. Download the track in Minor Trails GPX file. ​We do not know why this is named Walnut Canyon - we have not seen any walnut trees. 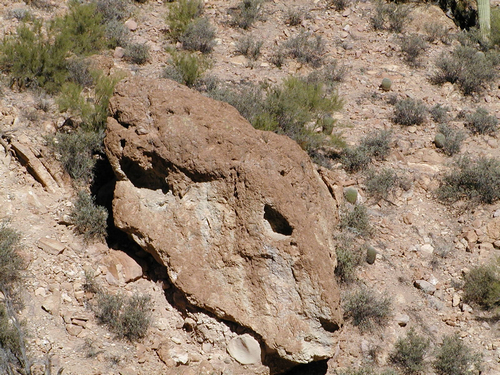 Our best guess is that big rocks fall from a brown layer high on the cliffs and are scattered on the lower slopes. With a little imagination these brown rocks could be interpreted as walnuts. With a little more imagination this one could be interpreted as a cow skull. Great trip. You are sure to enjoy it. A walnut, or a scull?